Sav-a-Bull dogs adopted into loving and capable homes. Before: the first photo reflects the situation they were rescued from (shelter, where they were abandoned, etc). After: the photos that follow are the same dog living happily and successfully in their new home. Click to enlarge the photos and please keep scrolling down, as we're happy to say, there are lots of deserving and wonderful Saved-Bulls to see! SOPHIE. Rescued after being abandoned at a Manhattan vet facility. Sophie is now living happy and successfully with two human sisters Celia and Maddy, one furry sister Penny and two wonderful human parents, Mike and Christine. She is also the BEST pillow and princess-ribbon-time playmate! CLAIRE. Rescued from being left chained for months to a cement wall in New Lots for being "shy." After receiving care and time to decompress, we took Claire for a ride from Brooklyn to Boston where she began her new wonderful and safe life. Now the only thing she has to be afraid of is bath water. TYSON. Rescued after a two-year wait, from a shelter in Long Island. Now Tyson is having a wonderful time deciding which he likes best...being king of the dog run, pillow stealer, brother to Tommy, kitty snuggle buddy or goat herder...Tyson is loving his new life! REGGIE. Rescued from a shelter in Long Island after being found as a stray. He now is living happily with his mommy Taylor and his daddy Jake who are the some of the best doggie parents ever! From being sad and completely withdrawn in a cage to hitting the doggie jackpot in Manhattan, we are so incredibly happy for Reggie! CAPPIE. Rescued from the sick ward at kill shelter in Manhattan on a very rainy evening. She is now a healthy, loving, loyal and proud older doggie sister to her beautiful, human baby brother. KEITH. Rescued from being tethered to an 18-wheeler in a scrap metal yard in Queens. After 18 months, lots of specialized training and a couple of failed adoptions in the city, Sav-a-Bull determined that a life away from concrete, kennels and traffic was what Keith needed. And we are very, very happy to say Keith is now living successfully with his human dad Don. There he swims in a lake, plays with his furry German Shepard sister Stella and cat brother and hikes every day! JONAH. 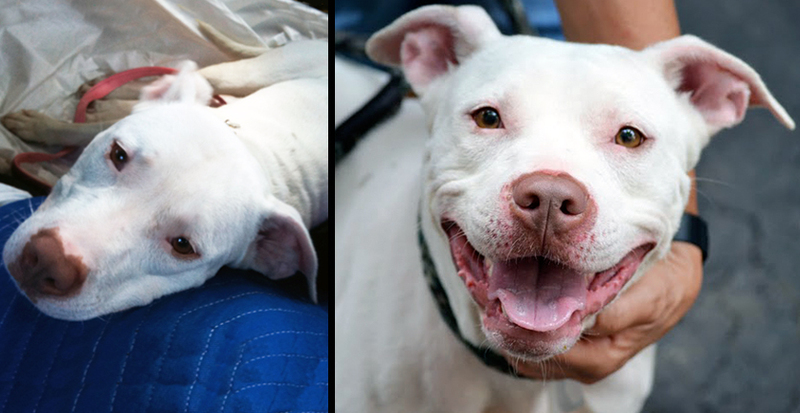 Rescued after a 16-month wait, from a shelter in Long Island by Sav-a-Bull in partnership with ARF. Jonah is now happily living in Boston and is beloved by his mom Lucia and dad Mike. He is also has won over everyone in his dad's software development company, where he helps them with programing every day. DAN. Rescued from the euthanasia list at a kill shelter in Manhattan. Dan is now a registered therapy dog for veterans with PTSD, a “breed ambass-a-dog” brother to two silly pugs, and is also the inspiration and for Sav-a-Bull Pit Bull Rescue. ELI. 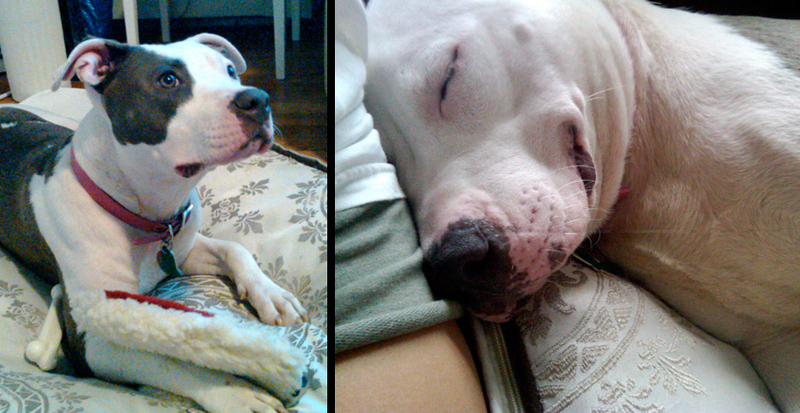 Rescued from a shelter in Long Island, Eli suffered from severe separation anxiety. As a result every member of Sav-a-Bull, many of our trusted friends, family, training and daycare partners spent every hour of every day with Eli for over a year. With all of this help Eli was finally able to overcome his separation anxiety (yay) and was adopted. But we must admit, we all fell head over heels in love with him and miss spending our time with this incredibly sweet, smart, snuggly and very special boy. ONYX. Rescued after a two-year wait, from a shelter in Long Island. Sweet and sensitive Onyx was anxious in his cage at the shelter. Now Onyx is providing unconditional love, and is helping his new human mom Madeline successfully overcome anxiety and confidence issues of her own. YAY for Onyx. STELLA. Rescued from a kill shelter in Manhattan after being used to breed and then abandoned. Stella now spends her days couch snuggling with her mom and Sav-a-Bull board member Vanessa and her pit bull and beagle brothers. WINNIE. Rescued from a shelter in Long Island after being found as a stray. Sweet, loving and wonderful Winnie now spends her days playing with her adopted furry brother Ray and getting tons of love and affection from her human sisters Taylor and Macy and mom Mindy and dad Russ. CALVIN. Rescued after a year wait, from a shelter in Long Island. Calvin now gets to listen to his dad Andrew compose music in their Brooklyn home all week long and enjoy cookouts with all of his new human friends on his weekends. Calvin is also the subject of our first ever adventure photo series "Calvin's fantastic fantasy." WILSON. Rescued from a kill shelter in Brooklyn. He now loves playing with his old neighbor and best doggie friend Stella, playing fetch with his daddy Sean and eating green apples every chance he has. RUDY. Rescued from a kill-shelter in Manhattan. This sweet boy initially suffered from separation anxiety, and spent every day with Sav-a-Bull. Now he is living happily and anxiety-free in New Jersey with his human brothers and sister and his big furry brother Rocco. McMOUCHE. Rescued from a kill shelter in Staten Island during a hurricane evacuation. He was diagnosed with an autoimmune disorder that prevented him from walking. After months of medical care, treatment, love and lots of wagon-walks the only thing that stops Mouche from a jog now is the rain. GRACE. Rescued from being abandoned, tied to a chain link fence in the Bronx. She is now a certified canine good citizen and helps rehabilitate other dogs in need, including her brother (and Sav-a-Bull rescue - Charlie). CHARLIE. Abandoned at a vet facility in Queens, Charlie has left his days of being caged in a basement for being spoiled silly with furry sister Grace, including socks sewn by hand by mom Jobanny, and even carried around by his daddy Jean. ROBBIE. Rescued from a shelter in Long Island, Robbie is Sav-a-Bull's only "German-Shepard-a-Bull" as when we met Robbie we knew we had to make an exception. He was so severely malnourished that he too weak to walk, but despite this, he was trusting and showered us with affection. Now Robbie is happy, healthy and living in Canada with his German Shepard brother Bruce, where they both spend lots of time teaching kids the importance of animals at their human mommy's daycare. TOMMY. Rescued from a kill shelter in Manhattan, as a 5-month old puppy, because he was too "puppy-like." Tommy is now loving life with his new family in Long Beach where he can romp, snuggle and play, like a puppy, to his hearts content. REX. Rescued from a kill shelter in Manhattan. Rex is now in advanced AKC rally classes and competes for blue ribbons (which look gorgeous against his golden mane) he is also an Aspen regular and loves running on the mountain as his family skis. FINN. Rescued after a year and a half wait, from a shelter in Long Island. Gorgeous Finn now lives with his mom Kim, dad Jim and their enormous backyard, where he gets to run, play and watch deer and squirrels all day. He also gets to do his favorite thing in the world every night, snuggle in bed curled up between his loving parents. CHEVY CHASE. Rescued from a kill shelter in Manhattan. Chevy Chase now inspires as much laughter and happiness as his namesake with his love of snuggling, his gorgeous Batman ears and his silly grass-rolling and swimming antics. KIMBERLY. Rescued from a shelter in Long Island. Kimberly is now living happily in the home of her foster failure mommy Elizabeth. Luckily Elizabeth also owns a doggie day care, so Kimberly gets to spend time with her special furry and human friends every day. CHESTER. Rescued after a three-year wait from a shelter in Long Island. He now lives in a loving home with his dad Frank and doggie brother Moose. He was also a foster brother for Sav-a-Bull dog Jax (until he was adopted by Frank's parents :)). MURPHY. Rescued from anti-pit bull housing in NJ. Now he lives happily in Boston with awesome mom Liz and dad Jason. Murphy (Murf-Money to his friends) no longer hidden in a crate in the basement - now helps teach at-risk kids the importance of treating animals with care and respect - through an anti-violence program at ROCA. HARMONIA. Rescued from the euthanasia list at a kill shelter in Manhattan. Harmonia now loves nothing more than to greet every dog and every human at her Brooklyn dog park - including her separated-at-birth twin (Sav-a-Bull's very own) Dan. OBLINA. Rescued from the euthanasia list at a kill shelter in Manhattan. She is one of the sweetest girls anyone will ever meet. Oblina loves and hugs all people, dogs, cats and birds when given the chance and only asks for belly rubs from her mom Tricia in return. FELONY AND AMMO. Rescued from a kill shelter in Brooklyn the two are inseparable. Even when Felony is doing something Ammo is not a fan of (like a bath or a trip to the vet) he is by her side, always there for his beloved doggie sister. APOLLO. Rescued tied to chain link fence on one of the coldest winter nights in Brooklyn. With the help of Sav-a-Bull, Apollo received the necessary medical and training care and support he needed to become the beloved foster failure of the Gina and Matt, the incredible couple that unchained him saved his life that frigid night. RUBIE. Rescued after a three-and-a-half-year wait from a shelter in Long Island (by Delta’s mommy Kathi, at the photo shoot for Sav-a-Bull's "41 Pit Bulls" book). Now Rubie's wish has come true, she gets to run and play in a giant yard filled with all of her toys every day. DUKE. Rescued after being surrendered due to anti–pit bull housing regulations. Through a partnership with The Spot Experience and Sav-a-Bull, Duke was able to remain socialized, live with an experienced foster and receive the medical treatment he needed until he was able to be safely reunited with his family. LADY. Rescued from the euthanasia list at a kill shelter in Manhattan the day before Thanksgiving. Now she is loving life, with her own yard, quality time with human grandma all day and being spoiled rotten by her parents Eddy and Mel all evening. She is one lucky Lady! ARCHER. Rescued after a three-and-a-half-year wait from a shelter in Long Island. Now Archer lives in the lap of luxury with his wonderful human parents Karoline and Brendan and dog and cat siblings. After spending so long in the chaotic shelter environment Archer now enjoys taking quiet naps in preparation for taking more naps. EDITH. Rescued from the euthensia list from a kill shelter in Manhattan. Edith is now living with her doggie brother Archer who has taught her the importance of taking naps, in preparation for taking more naps. LUCY. Rescued from the euthanasia list from a kill shelter in Manhattan, despite being only a year old and having a perfect behavior rating. Lucy is now living happily in Brooklyn with her human daddy Alex and has doggie play dates with her Saved-Bull doggie cousin Stella. REAGAN. Rescued after being abandoned in Queens. Reagan has now graduated from puppy training school, loves her new family and friends and is still not a fan of evil rain or kitty cats. MILA. Rescued from a kill shelter in Manhattan, after being surrendered due to anti–pit bull housing regulations. Mila now lives a very happy life filled with love from her mom Laura, her best human friend Gio and her best doggie friend Chloe. ROCKY. Rescued from being left chained to a radiator in an apartment in Brooklyn. With the help of Sav-a-Bull Rocky has been adopted by Daisy's mom Erica. He now lives with the 2 of them, his new daddy Abe and his new furry sister Kuma. MICKEY. Rescued after a three-year wait from a shelter in Long Island thanks to the Sav-a-Bull Brookhaven Shelter Dog Video project http://sav-a-bull-ny.org/succeses/ incredibly sweet Mikey now enjoys his days playing in Manhattan and taking trips to the beach with his daddy Brian. EMMA. Rescued from from a kill shelter in Manhattan thanks to a partnership with Di-foster-trainer-extraordinaire and Sav-a-Bull. Once scared with terrible mange, sweet Emma is now living an exceptional life with mom Vanessa and dad Matthew. She gets to hike upstate, snuggle and enjoy homemade vegan treats with her doggie brother Quinn and four cat siblings. GIA. Rescued from the euthanasia list from a shelter in Brooklyn. She now is living happily in New Jersey where she gets lots of belly rubs, lots of snuggles and where she spends hours watching bumble bees fly in the backyard. Gia was rescued in honor of Brad Pitt Bull, who was surrendered to the shelter the same day, but was lost to an illness he caught while there. RILEY. Rescued from a shelter in Long Island after being diagnosed with a heart condition and abandoned. After a long search by Sav-a-Bull he was adopted by a vet tech (with his wonderful facility behind him) who is committed to providing this sweet boy the special life he deserves. MANDY. Rescued from the sick ward, at a kill shelter in Manhattan. She loves water (to drink, fetch and swim) so we found her a home in Long Beach. In return this special girl provides her new human mommy the unconditional love needed to ease the loss of her beloved son. ELI. Rescued from a shelter in Long Island after being found as a stray. He now is living happily with his mommy Marina - who is a dentist - so he now also has perfect teeth that glow against his beautiful blue coat. FRANKIE. Rescued from a kill shelter in Manhattan after being surrendered. She is now living in Boston with three loving mommies. Between the three, this beautiful spotted girl gets lots of snuggles, walks, jogs, hikes and dress-up-days! BROC. Rescued after his owner lost his job and home and had been living in his car for weeks with Broc. Sav-a-Bull cared for him as though he was our own, until his dad was on his feet again (which he is and they have been re-united). Oh and it was our pleasure! EMMA. Rescued from being abandoned, tied to a stoop, outside of a dog grooming facility. After some "doggie boot camp" training and some socialization with a wonderful foster, she is now living happily with her new daddy in uptown Manhattan. NICO. Rescued from the sick ward at a kill shelter in Manhattan. Now feeling 100%, Nico with the help of her dad and student Woodie, has single-handedly charmed the entire NYU campus, teaching everyone just how important it is to take a chance on a pit bull. SIERRA LUNA. Rescued from a kill shelter in Manhattan that is now using her image to help promote their facility. Hearing impaired but love-empowered, Sierra Luna has learned sign language from her mom Nicolle and dad Ariel. She now also has a new doggie sister named Sassy. SASSY. Found by Sierra Luna's parent she was abandoned in Brooklyn right after being used to breed. Sassy has since received all necessary medical care from Sav-a-Bull. Sassy has also been welcomed into their family and is now an adopted doggie sister to Sierra Luna. MONTY. Rescued from overflow, at a kill shelter in Manhattan. Monty (Private Montgomery "Monty" Kumar) is now living happily with his daddy Bharat. In his home he has staked claim to Bharat's ottoman, forcing him to rename it the "Montoman." RHINO. Rescued from the euthanasia list from a shelter in Manhattan. Once an abandoned dog left in a junkyard in Harlem, Rhino is now living in NJ with his very own loving family and giant yard to run and play safely and happily in. JAX. Rescued from a kill shelter in Manhattan. This lucky boy was supposed to spend one night with his foster grandma and grandpa, well that was a long, long, time ago, and they now admit they're two more Sav-a-Bull foster failures (we knew when we saw the embroidered "Jax" Christmas stocking on day #10). YAY for Bob, Susan and Jax! REMI. Rescued from a shelter in Long Island after being found as a stray. Remi now lives happily in Brooklyn with his wonderful mom Mara and his dad Aaron, the lucky boy also gets to go to Maryland to visit and lounge in the sun with the rest of his human and doggie relatives. GAVIN. Rescued from a shelter in Long Island where he needed eye surgery. Thanks to medical care provided by Sav-a-Bull and boarding, training and love from Hounds Town USA, Gavin is now living a happy healthy life. JUBILEE. Rescued from the euthanasia list from a shelter in NJ. She now lives with her mommy Barbara, who is also a dog walker and sitter, so Jubilee gets to spend loads of time playing with all of her mommy's furry clients. Jubilee also recently became a sister to 2 rescued kitties. LEO. Rescued from the euthanasia list from a shelter in Manhattan by Stray from the Heart in partnership with Sav-a-Bull. Together we provided the medical care, training and time needed to prepare Leo for her amazing new life traveling the world with her recording artist daddy.